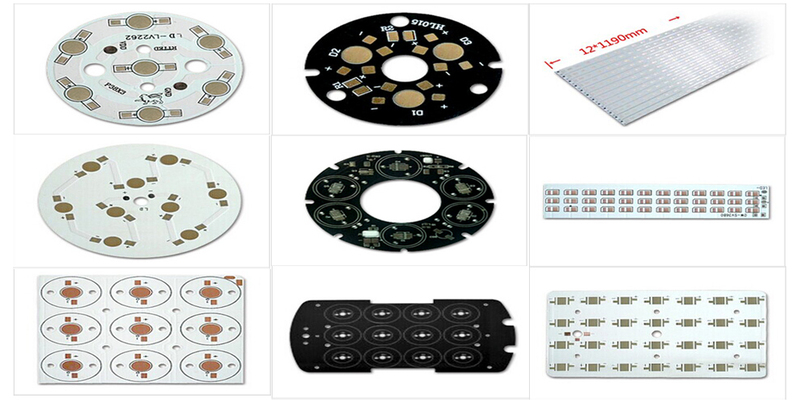 CHENONN ELEC has been producing Aluminum pcb (also called Metal base PCBs) for over a decade. Although originally envisioned for use in the power-supply industry these substrates are now most widely used in High Brightness LED products. There are many names for these products; Aluminum clad, aluminum base, Metal clad(MCPCB), Insulated Metal Substrate(IMS or IMPCB), Thermally conductive PCBs, etc… but they all mean the same thing. A thin layer of thermally conductive but electrically insulating dielectric is laminated between a metal base and a copper foil. The copper foil is etched into the desired circuit pattern and the metal base draws heat away from this circuit through the thin dielectric. The heat dissipation afforded by this construction is dramatically superior to standard FR-4 constructions. The dielectrics used are typically 5 to 10 times as thermally conductive as conventional epoxy-glass and a tenth of the thickness resulting in thermal transfer exponentially more efficient than a conventional rigid PCB. This is so effective that lower copper weights than suggested by the IPC heat-rise charts can be used. Although Power Converters and LEDs are the largest users of these products, Automotive and RF companies are also looking to take advantage of the benefits of these constructions. A single layer construction is the simplest, most thermally conductive and most cost effective construction. Designs with higher component counts may not have room for all the required routing on a single layer. In this case a two layer design is required. A thin sheet of dielectric, typically around .006” thick, is drilled, plated and etched much like a standard double sided printed circuit board. The sheet is then laminated using thermally conductive bonding material to the metal base. This extra routing layer results in components farther away from the heat-sink and reduced heat transfer so this construction is recommended only when necessary. Automotive: Head lights, Tail light assemblies, Running side markers, Dash board, interior lighting. Military: Head lights, Running lights, Spot lights, Signal beacons, High power flash lights, Power converters, Power supplies, Power transmission systems, Ignition systems, Power distribution products. Aerospace: Aircraft landing lights, Running lights, Cabin mood lighting systems, Spot light and general lighting. Consumer: Street lighting, Traffic control lighting, Interior building lights, Landscape lighting, Camping gear. Medical: Operating room lighting, Surgical lighting tools, High power scanning technology, Power converters.